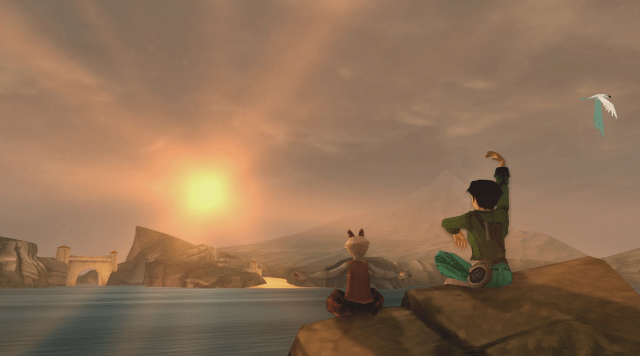 You’re going to have to cast your minds back for this one as we look back at 15 years of Beyond Good & Evil. To give you some context, the game has been around in my lifetime longer than it hasn’t been, having come out when I was only 13 years old! In the week commencing 1st December 2003, competition came in the form of the console release of Max Payne 2. The IP was still at Remedy Entertainment at this point and whilst it received critical acclaim, it didn’t sell as well as expected – much like Beyond Good & Evil itself. Away from the world of gaming, legendary musicians Elvis Costello and Diana Krall got married at the home of Elton John, and the biggest film releases were Honey starring Jessica Alba and The Last Samurai featuring Tom Cruise. 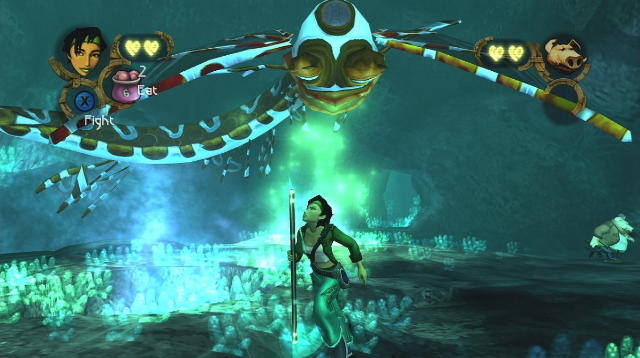 Beyond Good & Evil released in North America on 11th November 2003, for the PlayStation 2. Xbox and Gamecube owners had to wait a bit longer as it released on 2nd December and 11th December respectively. European gamers had to wait longer still as it released on Xbox and Gamecube in their region on 27th February 2004! BG&E is, first and foremost, an action-adventure game, with many describing it as a Zelda-lite experience. It will take you from your home to underground caves and then to factories that hide a sinister secret, with a whole host of side activities in between. The main quests adopt combat, stealth and exploration mechanics and all feel very fine-tuned rather than tacked on. The story is a linear experience, but the amount of stuff to do in between the main missions is varied enough, and more importantly, executed very well. 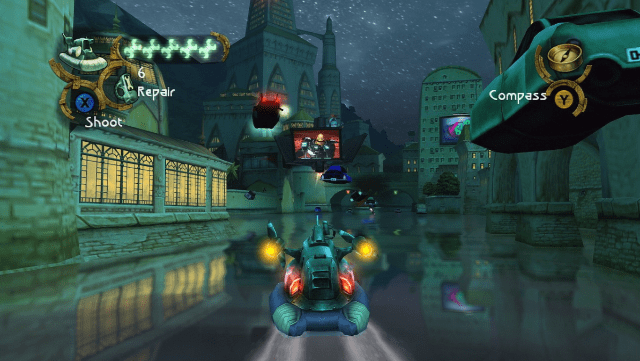 There are also hovercraft races, minigames in a local bar, and plenty of secret areas. The game is set in 2435 on the small island of Hillys. It’s an interesting glimpse of the future than what we would typically be used to; where we would expect chrome skyscrapers and flying cars, we instead have a lush world of green and rustic-styled buildings, the sort that wouldn’t look out of place in a Mediterranean setting. Hillys is a planet where time has mostly slowed down. The fauna however has evolved tremendously in the 400+ years. Many animals are now bipeds and can converse with humans. Your local mechanics garage is run by Rastafarian rhinoceroses and your guardian and father figure is a boar with bad wind. You play as Jade who, along with Pey’j the boar, run a lighthouse as a home for children orphaned by DomZ attacks (more on those later). Jade and the game were designed by Michel Ancel, also of Rayman and King Kong fame, as a character that people could relate to. She was never over-sexualised like previous female protagonists that had come before her such as Samus and Lara Croft, and did help with the cultural change, though we could do with a reminder of who she is and what she is all about. Instead she was a caring protagonist; looking after the orphanage and regularly saving her own guardian Pey’j from various perils. As a photojournalist, Jade is given a job to take photos of every species of animal on the planet, which in turn represents the main way to make money in the game, but also helps progress the plot. She is contacted by a stranger to take a photo of an animal deep in a cave, presumed to be a DomZ animal. The DomZ are an alien species who are continually attacking and kidnapping Hillyans to either drain their life force or turn them into slaves. Hillys has a military called the Alpha Section that are primarily tasked with repelling these attacks, but a certain group of Hillyans believe the DomZ and the Alpha Section are in cahoots with each other and want Jade to discover the truth behind it all. Jade’s journey goes from the cave to a factory to search for proof of the DomZ and Alpha Sections collaboration, but this search will take her further afield to Hillys’ moon, Selene. The deeper she goes into finding the truth, the darker the story gets. Despite receiving a PEGI 7+ rating on first release, there are some nasty and mature elements to the story. There are prisoners, High Priests, spaceships, human trafficking, and a plot device not too dissimilar to Harry Potter and his Deathly Hallows. Plus, a post-credits scene that manages to set up a sequel perfectly. But the game is still readily available, so we won’t be giving away the full reveal here. That’s because Beyond Good & Evil received a HD re-release back in 2011, that many saw as Ubisoft testing the waters for potential sequel. 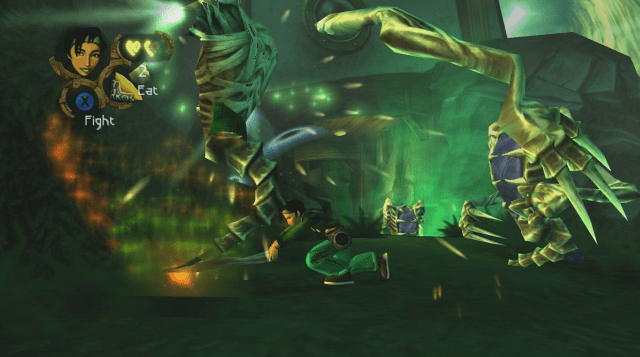 A sequel had been discussed internally for many years following the release of the first game, with trailers released/leaked, showing an older Jade and Pey’j. However, this version of the sequel ultimately came to nothing. The HD release was on the Xbox 360, but is now playable on Xbox One thanks for Backwards Compatibility. The sequel that we are getting was formally announced by Ubisoft in 2016 with Ancel himself sharing concept art of a younger Pey’j, before an initial trailer was shown at E3 2017. It is in fact a prequel. The trailer introduced a host of new characters, and a host of swear words not originally present in the first game. The characters shown for the prequel had potty mouths that felt forced, and many interactions with online players are less than thrilling. To be completely honest, I was less than impressed. And then we got the news that it would be a shared universe and feature multiplayer components. This all feels like a cheap way to get more people into the franchise; a cult following for what it already has produced, not what it will produce. I don’t think new players trying the prequel will go back and play the first one afterwards, because they already sound too distinct from one another. BG&E had an amazing cast of characters: not just Jade and Pey’j but there was also Secundo, Jade’s virtual assistant was always on hand when needed, as well as the characters she meets on her journey whether they be the punters in the bar, employers, or prisoners that need rescuing. The NPCs in this game brought so much personality and character to the overall package, it really did feel like a living and breathing world even back in 2003. Which, in context with the planned prequel, starts to justify it and make more sense. If Ubisoft can replicate the charm of the first in the prequel, then they will be onto a winner. The original was a game that I played on initial release for the PlayStation 2, and then later on PC. I remember also downloading the HD release the day it came out on Xbox 360, and again when it went on sale for the PlayStation 3. It’s fair to say, I’m a huge fan. Interestingly though, the 360 version was the first time I actually managed to complete it; on previous versions I always struggled with the last boss battle. Undoubtedly, I will get the second game – and probably whatever special edition Ubisoft decides to ship – just because it’s a world I’ve loved for 15 years. I want to see if the rhinos still sing their reggae song every time you enter the garage, and visit the Akuda bar again, but I also want to see what else is out in this universe. I think there will be more than a couple of references and easter eggs in the new game to remind players of the first experience, and why they enjoyed it so much first time around. What are your memories of BG&E? Did you play it on initial release or was your first time with this world the one found in the HD version? What are your thoughts on the prequel? Leave us a comment below and let’s discuss our experiences!